With a constantly changing market, assessing the potential risks and rewards of and investment can be tricky. As you build your portfolio, you may be in search of the ideal investment that helps bring in a maximized return while minimizing risks. This type of investment is almost impossible find, but that hasn’t stopped people from developing strategies and theories to achieve the perfect investment. One of the most popular by far, is the Modern Portfolio Theory (MPT). In 1952, Harry Markowitz shook up the asset management world with his essay published in the Journal of Finance, which outlined his Modern Portfolio Theory. Essentially, the theory was crafted to help investors build a portfolio that maximizes expected returns based on any level of market risks. The idea behind his theory was that one should build a diverse portfolio of unrelated assets in order to better reduce risks. Essentially, investor’s shouldn’t put all of their eggs in one basket. The reason this theory is still popular today is because it is highly appealing to risk-averse investors. By creating a diversified portfolio with a variety assets, you are guaranteed to see a return no matter the market climate. If one stock suffers, you should have another that would thrive, setting you up to see returns no matter the circumstances. Markowitz advocated that proper investment isn’t just about choosing assets, but instead finding the right combination of assets would significantly improve your risk-return ratio. 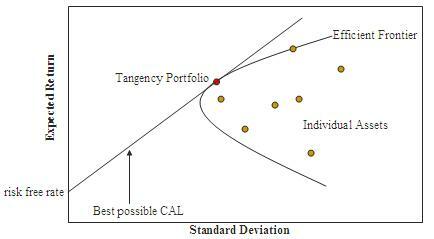 To understand Modern Portfolio Theory, you must be aware of returns and risks related to investments. Returns are considered to be the appreciation of an asset over time – how much it rises in stock price or dividends. Systematic Risks: Market risks that cannot be diversified, such as interest rates, wars and recessions. Unsystematic Risks: Also known as specific risks, these risks are not correlated to general market fluctuations. Once you have an understanding of an investment’s risks and returns, you can map out all the possible portfolio combinations on a graph to visualize the best outcome. Risks are on the X-axis and returns are on the Y-axis. The Efficient Frontier is an upward sloping hyperbola, or curve, that represents the best combinations for an optimal outcome. 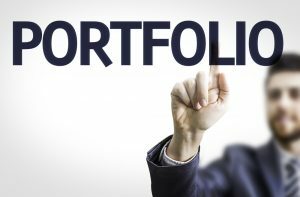 Any portfolios that fall near or along the Efficient Frontier are advised as a good investment, while portfolios that fall below are considered high-risk with low reward and are not desireable. Being aware of risks can help craft a diverse portfolio, but it’s important to remember that risks aren’t always something to shy away from in the investment world. In fact, they’re necessary and the adage rings true: “High risk equals high reward.” But managing those risks is what Modern Portfolio Theory is all about.